This is tuned up for people who think SUPER difficulty is easy, which isn’t me, maybe try labeling your hack description better. I mean it dude, you tricked me into playing a hardtype, label it, PROPERLY. You’re supposed to make the Gizmo fight a good introduction into fighting mechanics, not trying to give me game over in 2 turns flat. You put gizmos too close, buffed them to be stronger than my party, outnumber me two to one, on top of Sarah being a mage instead of a priest, followed by a Bowie level up that would make Hans from vanilla Shining Force proud. All of these might sound ok on their own, but put together it’s a recipe for the worst intro fight. I turned on control opponent to see a few more fights and I just can’t fathom not having to use a healing herb after every action. Having everyone counter on top of adding mechanics to easily circumvent them just makes those attacks much more desirable if not necessary. I’m just going to attack in a way that they can’t hit back, 100% of the time, this doesn’t promote strategy, it goes against it. Even if it gets better if I keep playing, this is a bad first impression. There are a lot of neat changes I’m glad were added like Peter joining early, all four Creed members joining, counters give EXP, EXP scaling, etc. too bad I can’t stand anything else to get to truly appreciate them. 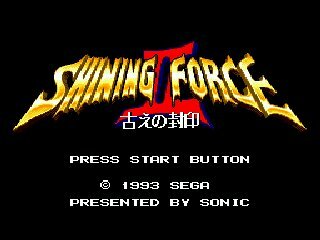 Been playing Shining Force 2 mods for a while, this is easily the worst mod I’ve played for it.